One of the chief goals of nearly all organizations today is to infuse data into every decision and action. Yet only recently have BI tools become easy enough for business users to deploy and implement without considerable IT support. 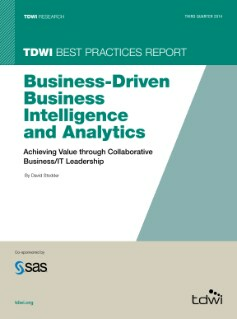 This TDWI Best Practices Report explores how organizations are taking advantage of this trend by realigning business-IT collaboration to avoid pitfalls and allocate resources. It also examines why many organizations have established a BI and analytics center of excellence or competency center in order to share best practices, foster collaboration, manage data governance and more.